Standard Forex Signals service fee: for 600 pips. * You will receive extra days for free to cover it. ඔබ මුදල් ගෙවන්නේ ෆොරෙක්ස් සිග්නල්ස් ලැබෙන දින ගණනට නොව pips ගණනටය. සඳුදා හැර සතියකට ෆොරෙක්ස් සිග්නල්ස් 4ක් හෝ 5ක් පමණ සහ එමගින් අවම පිප්ස් (pips) 600 ක් (මුදල් යුගලයේ අගයෙහි වෙනස, එනම් උදා: 1.0060 - 1.0030 = 30 pips, ලෙස 30 x 20 = 600 pips) පමණ ලබාගැනීමට එනම් උදාහරණයක් ලෙස $500 ක් හෝ අවම $100 ක පමණ වන ගිණුමක් සඳහා කුඩාම ගනුදෙනුව වන 0.01 ලොට් (lot) වලින් යොදන ගනුදෙනුවකට පිප්ස් 30 බැගින් ගනුදෙනු 20 ක් හෝ පිප්ස් 600 ට සමාන වන පරිදි පිප්ස් 20 ත් 80 ත් අතර ෆොරෙක්ස් සිග්නල්ස් ප්‍රමාණයක් ලබාගෙන පිප්ස් 600 x $0.10 = $60 ක පමණ ලාභයක් අවම වශයෙන් ලබාගැනීම සඳහා ක් ගෙවිය යුතුය. $5000 ක හෝ $3000 ක පමණ වන ගිණුමක් සඳහා අප අනුමත කරන උපරිම ගනුදෙනුව වන 0.10 ලොට් (lot) වලින් යොදන ගනුදෙනු සිදුකල හැකි ෆොරෙක්ස් සිග්නල්ස් ප්‍රමාණයක් ලබාගෙන පිප්ස් 600 x $1.00 = $600 ක පමණ ලාභයක් ලබාගන්න. මුල් ආයෝජනය විශාල අවදානමට ලක් නොකර ලබන ලාභය පමණක් නැවත ආයෝජනයක් ලෙස භාවිතා කිරීම වඩාත් සුදුසුය. ඔබට ෆොරෙක්ස් (Forex) ගනුදෙනු කිරීම සඳහා ගිණුමක් සෑදීමේදී වෙබ් අඩවි වල ලිපිනයන් (links) භාවිතා කර ෆොරෙක්ස් බ්‍රෝකර් වෙබ්අඩවියෙහි ලියාපදිංචි වී අපගේ දීමනා ලබාගෙන නොමිලේ හෝ වට්ටම් සහිතව ෆොරෙක්ස් සිග්නල්ස් පළමුව ගෙවූ මාසයට පසුව ලබාගන්න. එසේ ලියාපදිංචි කර ඔබගේ සාමාජිකත්වය තහවුරු කරගැනීම සඳහා පහත සඳහන් විස්තර අපවෙත එවන්න. ඔබගේ හැඳුනුම සහ ලිපිනය තහවුරු කල හැකි ලියකියවිලි යවා ඔබගේ ෆොරෙක්ස් ගිණුම තහවුරු කර නොගෙන මුලින්ම ඔබ මුදල් තැන්පත් කරන්නේ නම් ඔබේ නිවැරදි තොරතුරු ඇතුලත් කිරීම මගින් ඔබගේ ගිණුමෙන් මුදල් නැවත ලබාගැනීමේදී සිදුවිය හැකි ප්‍රමාදයන් වලක්වා ගතහැකිය. එබැවින් නිවැරදි ලෙස ඔබගේ නම සහ ලිපිනය ඉංග්‍රීසියට පරිවර්තනය කර අපවෙත එවීම වඩාත් සුදුසු වේ. අප විසින් සාදාදෙන ගිණුමට උපරිම මාස දෙකක් ඇතුලතදී අවම $100 ක් තැන්පත් කරන අයට පමණක් මෙම සාමාජිකත්වය හිමිවේ. හැකිනම් මෙම පිටුවෙහි ලියාපදිංචි විය යුතු ආකාරය පෙන්වා ඇති උදාහරණයේ පරිදි ඔබ විසින්ම ඔබේ ෆොරෙක්ස් ගිණුම සාදාගෙන එම ගිණුමෙහි අංකය අප වෙත එවා ඔබගේ සාමාජිකත්වය තහවුරු කරගන්න. 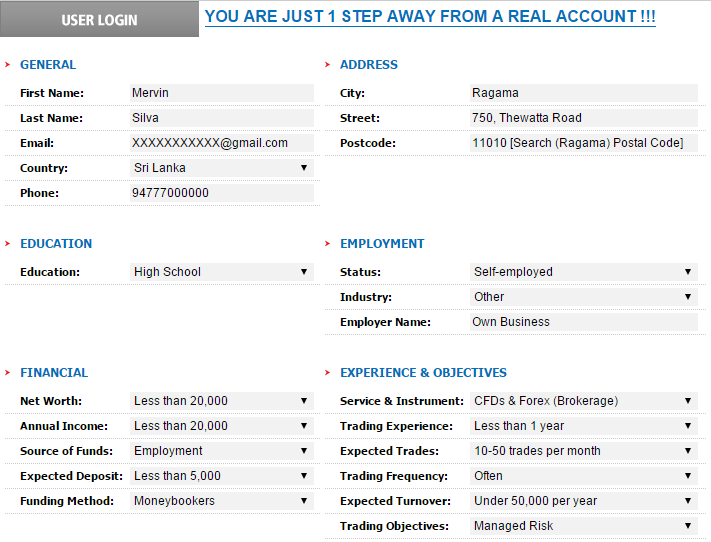 Bank Address: NO 280, MAIN STREET PETTAH, COLOMBO 11, Sri Lanka. Rs.2500 ($16) to receive Forex Scalping Alert & Basic FX Course Indicators with Forex Signals (600pips) from us with a help to learn to use Forex Signals (Get Online Help or visit Ragama House (near Vihara Mawatha, Thewatta Road) on Saturday or Sunday from 9am to 1pm). And then the new subscribers can get the Standard Subscription with extra 600 pips. Become a Patron to receive a 50% discount for Scalping Alert & Basic FX Course Indicators with Forex Signals. And the patrons can access our exclusive contents. When should I make the next payment for Forex Signals before the subscription expire? It will not expire within the first two months. After the first two months if your credit balance is equal or less than your subscription fee then it can expire after 1 month or within 3 months. It depends on the amount of pips you received each month. You can add another subscription month with a payment within the first two months or once after the credit balance become lower than the subscription fee within the first few months. But after that you have to make a payment within 1 month or before you receive the amount of pips of your subscription. If you made extra payments, then if your subscription will be expired after few months you will receive an email with this information "Forex Signals month start today, but your subscription will expire within 1 or 2 months.!" And if you received this information "Forex Signals month restart from today." then you have minimum 1 more month to complete the allocated amount of pips before the subscription expire, or before starting the next paid month. So you have to check the emails every month to find the expire date of your subscription. You pay money not for the days you receive Forex Signals, but for the amount of pips you receive. So you don't have to worry about the days it takes to receive a Forex Signal. If you made a payment to get signals and if you can't use the signals on any reason, you can't request a refund, because we give you paid educational materials and our time and other costs to setup your subscriber account. We take a moderate risk to make good profits. So you should be prepared to manage the risk, or you can use a demo account first to test your money management plans. We provide Forex signal on educational purposes and to show the success of our Algorithmic Forex trading systems, So you have to take the entire responsibility of your real trading transactions. We do not take any responsibility of your investments. And we don't encourage you to invest as well. You should manage the risk of your investment, and all the other responsibilities of your investments. So you will not receive a refund for any potential loss. You should be aware that trading financial instruments involves a high level of risk. Trade with the best Forex trading signals. For Members And Other Investors: $1 Per Month 60 Days Free Trial. For other users who are not members or investors: $4 Per Month 14 Days Free Trial. 1. Go to: FXCC OR XM Promotions to fill the application. Please contact us if you want to use a different broker. 3. Login to GS4X.COM to receive Forex Signals.